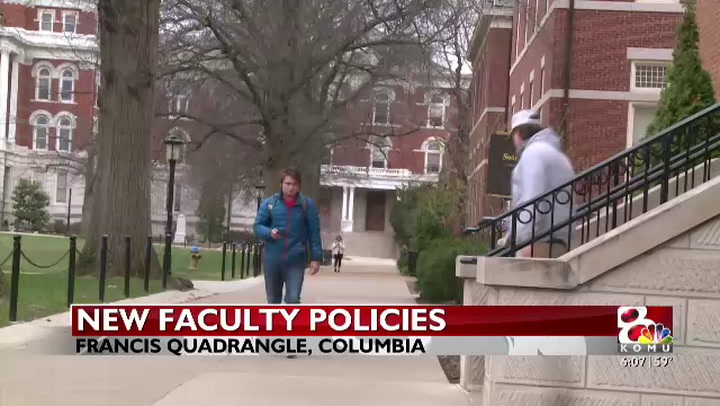 COLUMBIA - The UM System Board of Curators approved amendments to the University of Missouri-Columbia's collected rules governing faculty standards of conduct Thursday. Changes to the collected rules came from a review conducted over the past year by MU's Intercampus Faculty Council (IFC) and the University of Missouri Academic Officers (UMAO). The changes affect standards for faculty conduct, performance and workload. Ben Trachtenberg, chair of the IFC, said these changes were necessary. "After the events of Fall 2015, we realized that we had a lot of rules that were confusing," Trachtenberg said. "People genuinely didn't know what was allowed." Trachtenberg also said some of the rules were not as protective of the freedom of expression as he would like. He added that he and Hank Foley jointly appointed the committee which drafted these regulations. The committee met during the Spring 2016 semester, and these new regulations will go into effect June 1, 2017. Trachtenberg said these new rules only apply to the University of Missouri, and not the entire UM System. "I think that other campuses in the system may benefit from the tremendous amount of work that we did," Trachtenberg said. "If they want to adopt the rules exactly as they are or something similar, they're of course free to do so." Trachtenberg said he thinks these new rules will help clear up any questions faculty might have. "I think last year for example there were a lot of questions about contested use of public space," Trachtenberg said. "If multiple people want to be in a certain quad at once, how do we decide who gets it, how are we going to regulate things like megaphones and chalking." Trachtenberg said MU is very protective of the freedom of speech, and he wants people to feel free to communicate "robustly." Trachtenberg said people are generally free to say what they want to say. "The university is not in the business of deciding what messages people are allowed to convey," Trachtenberg said. "But we do have reasonable regulations on time, place and manner." Robery Jerry was on the Ad Hoc Joint Committee on Protests, Public Spaces, Free Speech, & the Press. Jerry said these new policies set forth a framework that provides guidance for the responsible, reasonable and lawful exercise of first amendment freedoms. "It shows Mizzou’s commitment to and leadership in promoting and protecting the robust exchange of ideas – which is essential to preparing our students for future leadership roles."